Welcome! The purpose of this UNIPS module is to guide you in planning and developing your courses with an entrepreneurial focus. This course is aimed for university teachers, doctoral students, and all the academic personnel with teaching duties and an interest in teaching and learning. modify your teaching by using elements of entrepreneurial pedagogy. You can study all of the materials independently. This module is also available for guided study (1 ECTS credit); for this option, please contact your own university and see the further instructions at the end of the module. Self-study means that you watch the videos and other materials independently. You can also take the tests and complete the assignments that interest you the most. You can do this at any time and in any order. Test your competences in entrepreneurship education (MTEE test). 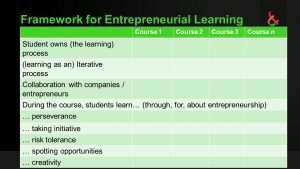 Evaluate your course by using the framework for entrepreneurship education. Take the MTEE test to find out more about your entrepreneurship and enterprise education competencies. Based on the results of the test, define the most important development areas that you should take into consideration when planning your teaching. Watch the videos about using the Framework for Entrepreneurial Learning. Select a set of courses and evaluate the different aspects of entrepreneurial learning by using the Framework for Entrepreneurial learning. Article 1: Mwasalwiba (2010), Entrepreneurship education: a review of its objectives, teaching methods, and impact indicators, Education + Training 52(1). Article 2: Pittaway and Cope (2007), Entrepreneurship Education: A Systematic Review of the Evidence, International Small Business Journal 25(5). Article 3: Pittaway and Thorpe (2012), A framework for entrepreneurial learning: A tribute to Jason Cope, Entrepreneurship & Regional Development 24(9-10). Contact your own university for information regarding guided studies based on these materials.